Required real estate broker training course to get a Real Estate Broker License. The OnlineEd Oregon Real Estate Broker pre-license training course is authored and instructed by practicing Oregon real estate brokers. With us, you get an Oregon course written by experienced Oregon authors. This Oregon real estate training course package includes online Exam Prep. With OnlineEd's Price-Match Bundle you'll receive OnlineEd's excellent course material at the most economic price. Online testing and grading with instructor feedback and answer explanations. Many links to forms, examples, and additional information in the supplemental File Cabinet, including a glossary of common real estate terms. This package includes everything you need to complete your education and pass your real estate licensing exam. This Oregon Real Estate Broker Pre-License Training Course is approved by the Oregon Real Estate Agency to meet the educational requirements necessary to obtain a real estate broker license. We are an Oregon licensed vocational school, regulated by the Oregon Higher Education Coordinating Commission and properly authorized to offer real estate broker pre-licensing education. The course delivery method is approved by the Association of Real Estate License Law Officials (ARELLO). Because of Real Estate Agency regulations on publishing state licensing exam pass rates, please call us at 503-670-9278 to learn about OnlineEd students' broker licensing exam pass rates. OnlineEd will reimburse your state licensing examination fee, plus your OnlineEd course instructor will remain available to help you study if you do not pass the state exam on the first try, as long as you take your state exam within 25 days of completing your course. To qualify for the First-Time Pass Guarantee, you must successfully complete the licensing course as well as practice for the state licensing exam by going through each bank of questions in our Exam Prep course at least once. You will also have to fulfill the requirements outlined below. Each module is further divided into smaller sections called "segments." Throughout the segments there are activities for you to complete, including audio/visual presentations, reading assignments, and simple learning assessments. At the end of each module, you are presented with a final learning assessment. These seven module final learning assessments are required by the Oregon Real Estate Agency in order to demonstrate competency in the subject matter of the modules. For the most part, these assessments are made from multiple choice questions. Once you pass a module final assessment with a minimum score of 75%, you are granted access to the next module. While the course and our delivery method will adequately prepare you for your module final learning assessments, your OnlineEd Certified Designated Course Instructor is also available to help you prepare or review your results. The course is available in English-only. The cost of your course represents tuition and fees. Fees are detailed in the course enrollment terms of service. If a payment plan is needed, you would like to apply for a veteran discount, or if you plan to pay using an assistance program, please call our business office, toll free, at (866) 519-9597 and ask to speak with the School Director's Office. To enroll online, just add the course to your shopping cart and follow the instructions. You can find a demo of our course and delivery method or request more information by clicking the appropriate buttons at: https://www.onlineed.com/info/RealEstate/Oregon/LicenseTraining/ . You can enroll in the course online or by telephone. To enroll by telephone, just call our business office at (503) 670-9278 or toll free at (866) 519-9597, Monday through Friday, 9:00 AM to 4:30 PM. To enroll online, just go to https://www.onlineed.com/info/RealEstate/Oregon/LicenseTraining/ , click on View & Buy Courses, select your course, and proceed to checkout. Enrollment online is available at any time and includes an automated tour of the course and delivery method. Once you are enrolled, you may begin your course immediately. The course is delivered wholly online, so there isn't any waiting for anything to be delivered. Upon enrollment, you will be attached to an OnlineEd Designated Certified Course Instructor. Each OnlineEd Certified Course Instructor is an Oregon resident, licensed as Oregon Higher Education Coordinating Commission vocational instructor, approved as an instructor by the Oregon Real Estate Agency, an Oregon licensed real estate principal broker, has been awarded the CDEi(TM) (Certified Distance Education Instructor) by the International Certified Distance Education Certification Center; and was rigorously vetted, approved, and trained by OnlineEd to meet our requirements for online course instruction and receive our designation of Certified Course Instructor. Your instructor is available for you to contact either by telephone or email, during scheduled hours, whenever you think contact will be helpful to review or explain course content or quizzes. Your instructor will also automatically review course assessments to make sure you understand course concepts. Our course is delivered as adult education, so you can use your instructor as little or as much as you like. 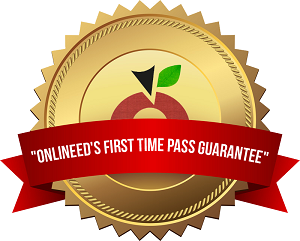 OnlineEd's Chief Certified Course Instructor is Marilee Mascarenhas, an Oregon Principal Real Estate Broker. Ms. Mascarenhas is also our Oregon real estate license subject matter expert and assists with ongoing development and instruction of the OnlineEd course materials. Technical support questions should be directed to OnlineEd, Inc. and not the instructor. Students are not required to use this service. OnlineEd reserves the right refuse instructor support to students that abuse this service. You can complete your course at your own pace, but must finish it within the 240 calendar day enrollment period. If you do not finish within the enrollment period, your course will expire and no longer be accessible to you. If your course expires, you may extend it for one-time only. Extensions are for 60 days from the date of the end of the original enrollment period (not from the date the extension is requested) and must be accompanied by the applicable extension fee. If you withdraw from the course or request a refund, and then want to continue the course, you must enroll in the course again, at the current catalog price, and start over from the beginning. Should you have a medical emergency, death in the family, or other extenuating circumstance that prevents you from completing your course during its enrollment period, you may petition the School Director for a one-time Extenuating Circumstance Extension Fee Waiver. Extenuating Circumstance Extension Fee Waivers are not automatic, are at the option of the School Director, and should be directed to the School Director's Office at: schooldirector@onlineed.com. With exception of instructor support offered by telephone and email, the course, its materials, and delivery system are entirely over the Internet. In order to be able to access and complete the course, you will need access to the Internet and an Internet-ready computer system, including a CPU, monitor, keyboard, and mouse. Our OnlineEd delivery method works with all modern web browsers and operating systems. The course may be read online, be printed to your printer, or saved to disc. Most chapters are also available in MP3 audio format. If you would like a printed soft-bound book copy of the course for study or reference, select a course package that includes a book or purchase one at catalog price, plus shipping. Regardless of your study method, the course must be completed online. Activate and print your license! The fingerprints collected at the PSI testing center are sent electronically to the Oregon Real Estate Agency, who then digitally transfers them to law enforcement for processing. If you pass the licensing exam AND background check, you will receive an email from the Oregon Real Estate Agency with a hyperlink to access your license. The Oregon Higher Education Coordinating Commission requires you must be at least 18 years of age to enroll in this real estate pre-licensing courses. This course will remain available to students for 240 days after purchase. This course is a study guide to help you pass the Oregon real estate licensing exam. It is not required educational credit towards your course completion, but it will assist you with enforcing the topics covered in the OnlineEd pre-license courses. Completing this course is optional; the module is noninstructed. Each chapter contains a study exam of multiple choice question. You can retake the exams for additional practice as many times as you like until you feel comfortable with the study exam subjects. At the end of the exam prep course is a practice licensing exam that simulates the Oregon real estate licensing exam of 130 random questions in 3 hours and 15 minutes, which can be attempted as many times as you'd like. Each attempt will serve a new set of 130 questions. Course providers are NOT allowed to know the exact questions examinees will see on their actual licensing exam. This study course is to help applicants become familiar with all aspects of the real estate industry before registering to take the state licensing exam.